Build your own beach resort in Build It! Miami Beach Resort. Each level is a new year. Begin in the 1920s with simple bungalows and build your way through the decades with wonderful art-deco hotels, the invention of the cinema, the first fast-food diner and eventually giant luxury hotels right on the beach! Design the city of Miami Beach as you like it! On a big scrollable map you develop Miami Beach over the course of 60 years! While doing so, complete the challenging tasks that you are assigned within each level. Cash in on renting out your hotel rooms, while shops, restaurants and other leisure facilities bring you leasing receipts - provided that your resort has enough guests. Will you manage to juggle revenue, number of guests, the attractiveness of your city and all the many special requests your guests will demand of you? Alongside your tasks as property shark, mundane chores are also on your to-do list: repairs, deliveries, remodeling work and much more. 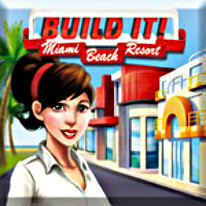 Miami Beach is in your hands in Build It! Miami Beach Resort.